1870: Maria Montessori was born on August 31 in Chiaravella, Italy. At five years he moved to live in Rome. 1884: At fourteen he entered the School of Engineering, was leaning toward the sciences, socially women were more oriented nursing or teaching. His mother supports him. The following year he changed his mind and enter medical school at the University of Rome. 1896 is the first Italian woman to graduate in medicine at the University of Rome. Create a special space for children diagnosed with mental retardation and separating them from adults, to avoid imitation behavior. 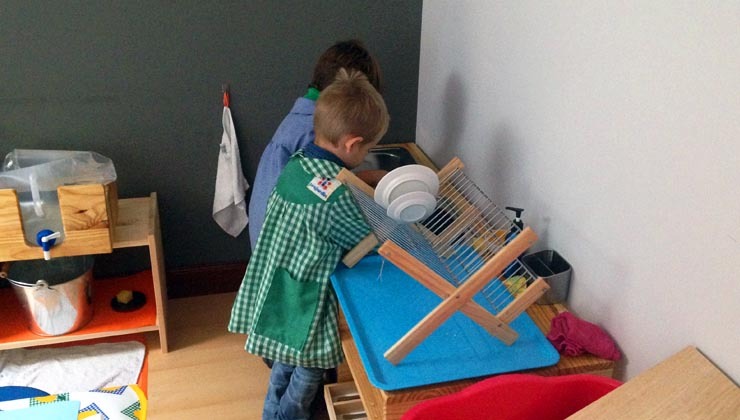 With the creation of sensory materials and practical life exercises that children managed to develop a spirit of self-confidence, independence and self-discipline. 1898: Children with mental retardation with whom he had worked were submitted to official examination alongside normal children and obtained the same results as these. Presented their work at the Congress of Teachers of Elementary School in Turin thereby strengthening the child with mental retardation should be treated more with a pedagogical approach that doctor. It is named director of the Institute Ortofrénico. 1907: First “La casa dei Bambini” Children’s House in Rome. In this space the district of San Lorenzo, riding his first school, takes things in your home: furniture, chairs, tables … to a picture of “La Virgen de la Silla” by Raphael, the emblem of turned Children’s House. And the children applied the method to the special children thus creating a more like a home than a school space. The choice of material was in the hands of children. He instructs the teacher to not offer it or imposed on the child, but to invite him to choose … and began to observe what children chose what materials. He made a selection. “When these children were placed in my care, I felt I was beginning something big: I found the hidden treasure in the child’s soul,” Maria Montessori. 1908: Another Children’s House opens for children of employees of low economic status. And in the neighborhood of Cologne, one for economy class wealthy. 1909: Publishes second book “The Method of Scientific Pedagogy”. Board your medical side with the master part and born Montessori methodology that we know. 1912: It is invited by the US research community, Graham Bell and opened the first Montessori school there. Once again it is the scientific community that is interested in their pedagogy. 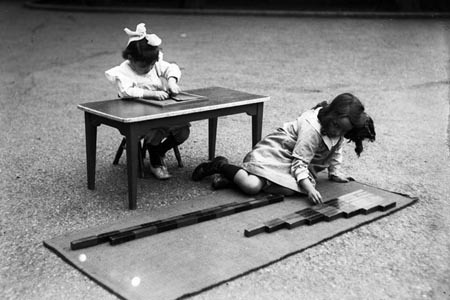 1913: First international course for Montessori guides in Rome and the Montessori Association was founded in the USA. 1915: Gives courses in California. Italy presented at the World Fair in San Francisco a glass Montessori classroom where children can see working with a guide, will provide the only two gold medals. 1916: Moves to Barcelona. He divides his time between the US and Barcelona. Education and lectures on his method at the University of Columbia in New York and Texas, USA. His books were published: “Self-education in the Elementary School” and “The Child Living in the Church”. 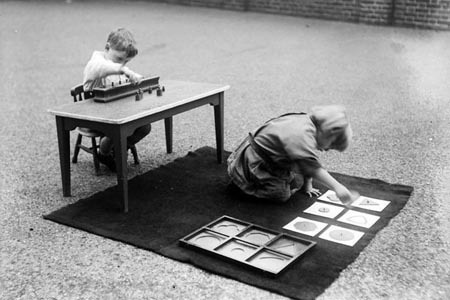 1918: In the Netherlands, receives the Queen and is implemented in all schools in the country the Montessori system. 1919: First International course in England. 1920: He took courses in Australia, Germany, Holland and Italy. He moved to Holland. 1921: Course in Naples, Italy. 1923: Receives Doctor Honoris Causa distinction Durhan, England. 1929: First International Montessori Congress in Denmark, during which he founded the Association Montessori Internationale (AMI) which is headquartered in the Netherlands. 1930: She teaches another course for guides Montessori in Rome. 1936: Maria Montessori is established in the Netherlands, having to leave Spain by the Civil War. 1938: It is invited to give a course in India by the Theosophical Society. His book “The Secret of Childhood” containing his works and ideas on the education of children of 0-6 years issued. 1939: Due to the war, the course closes in London and Dr. Montessori gives another course in India..
1940: In Los Angeles and Atlanta, USA, courses with appreciation the open AMI. Italy enters World War II he, Dr.. Montessori is confined in the Theosophical Society in India and his son Mario is interned in the camp for civilians. Unable to leave India, Maria Montessori, which is free, he is dedicated to give courses on their pedagogical approaches and develops those related to education of children of 6-12 years. 1947: She teaches another course in Madras, India, and sets the University Montessori, for political problems between India and Pakistan did not get to work. 1949: He gives a first course in Karachi, Pakistan. And it makes the X Montessori International Congress of San Remo, Italy. 1950: Publishes “The Absorbent Mind of the Child” and “Education for Peace” with the hope that with the right education world peace is achieved, the transformation of the world. 1952: Participates in the International Montessori Congress in London; it was his last public engagement. He died in Noordwijk, Netherlands, on May 6, at 81. Many of the works written by Dr. Montessori currently have a high appreciation for the studies that have been done on the child.